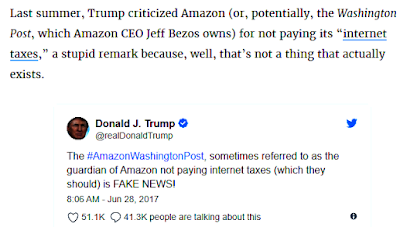 Amazon collects and pays a shitload of state taxes. Unless you live in Alaska, Delaware, Montana, New Hampshire, or Oregon, you are paying a sales tax whenever you make a purchase on Amazon. It is likely paying tens of millions of dollars in taxes to state and local governments each year. 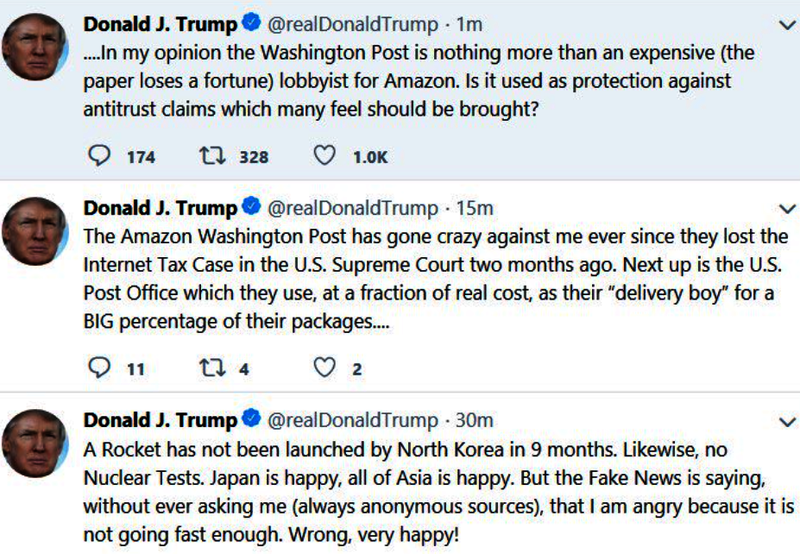 In total, according to its Securities and Exchange Commission filing, Amazon paid $412 million in taxes in 2016 and, according to CNBC, has a provisional tax expense of around $200 million last year. 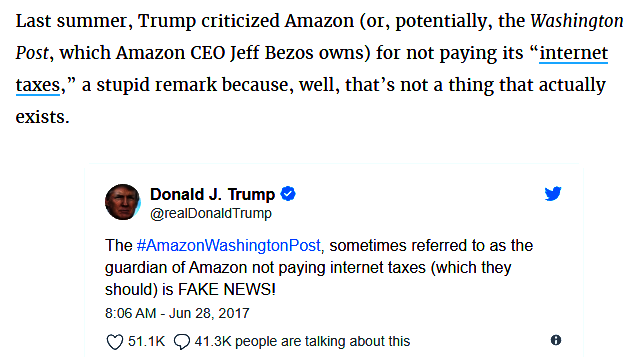 Let’s not forget, Amazon now owns every Whole Foods store in the country, so that’s even more state and local taxes. 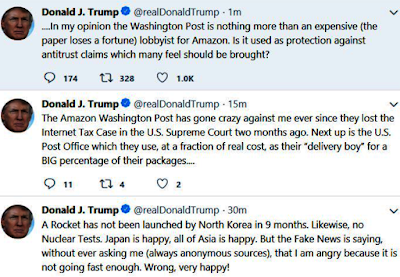 CNN (fake news): The company wants to help launch small businesses in the United States dedicated to taking its packages on the last step of their journey: from local Amazon sorting centers to the customers who ordered them ... which ships 5 billion packages a year globally. Amazon uses the USPS for an estimated 40% of its last-mile deliveries, paying bulk pricing. Trump has said he thinks it is a bad deal for the government. Amazon's new "Delivery Service Partners" and their staff members won't be employed by the tech company. The initial $10,000 costs will go to helping them start an independent business that has to begin with at least five delivery vans and ramp up to 20 vans over an undisclosed period of time. It's also setting aside $1 million to specifically recruit and help military veterans become partners. Drivers will be full-time workers instead of contractors, and Amazon will require business owners to give them paid time off and other benefits. Amazon would not say if it was requesting a set minimum wage for the drivers. The company has been building up its own fleet of 7,000 of trucks and 40 airplanes to cover the "middle mile" of delivery. 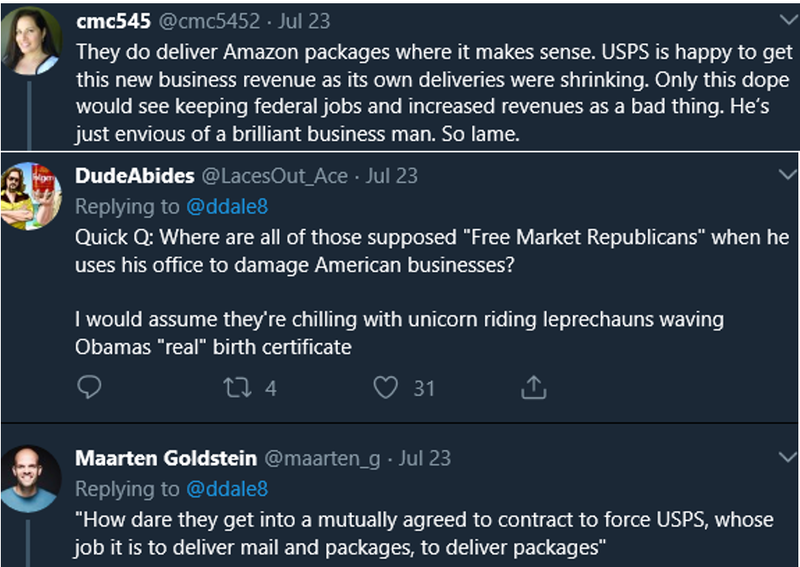 They haul goods between shipping centers and bear Amazon logos, but don't show up at customers' doorsteps. 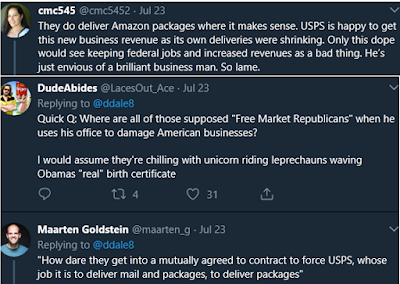 At the moment, that step is mostly handled by one of the many third-parties the company works with, such as FedEx (FDX), United Parcel Service (UPS), and the USPS.